Hi Friends! 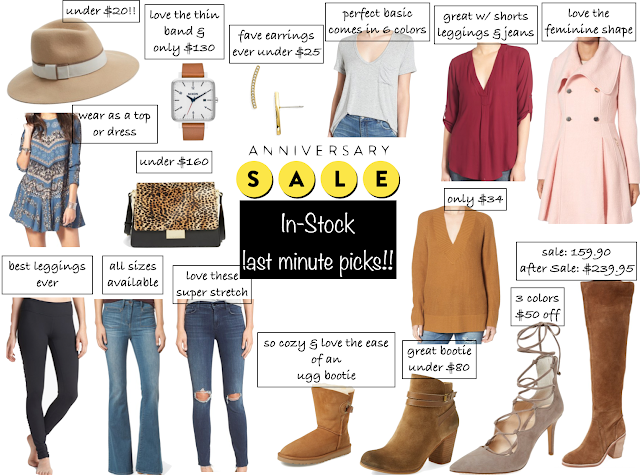 I am sure you are all tired of hearing about the Nordstrom Anniversary Sale by now, buuuut if by rare chance you have not shopped it or were thinking of adding a few more items to your fall closet, I wanted you to know that there is only 4 days left to save a ton until the prices all go back up. I want you all to be able to take advantage of this great savings off fall clothing, as most of these pieces are total closet staples. I think I own all but maybe 2 things on this list that actually are in my cart as I type. Hehe. I cannot believe this hat is less than $20. I am obsessed with this cognac watch and the skinnier band. I sold all of my metal watches months ago as they were feeling so heavy and this watch has that barely there feeling. And its $70 off! These earrings are my everyday pair and look great with everything! This bag I have been on the fence with, but now I am obsessed with the shape and pop of leopard and its in my cart ready for checkout. You can wear this beauty as a top or dress. I love it when a piece of clothing has dual purpose. This tee comes in 6 colors (I bought 3) and is less than $16. This top is so versatile and I love this wine color for fall and winter. And this light pink coat = heaven. So pretty and feminine. I love to mix pastels with fall colors and all white in the winter. This pullover sweater is a great staple. I love the dark camel and I bought it in black too. Shoes. Shoes. Shoes. I went a little crazy in the shoe department. These over the knee boots I bought last year and wore so much. You will love them and at $80 off I mean, run!! I love these lace-up heels. This grey color is gorggg but I have a tan pair that is super similar so I bought the black and am obsessed with them. These booties are a great all-purpose bootie for fall and less than $80 I might add. This tan color is perfect for wearing with everything but I already have several in this color family so I bought the burgundy and am obsessed!! Fall and winter would not be complete without Uggs. These short booties are perfect for slipping on with skinny jeans, leggings or I wear with PJ's around the house. These skinny jeans are so soft and stretchy. I love the 2-holes and the length is great if you're tall. This pair of flares are amazing as well. I love that they are slightly high-waisted and yet still have great length. Last but not least, everybody needs to own these leggings. I buy them over and over each year. They are such a staple and can be worn all year long. Remember: Nordstrom always has FREE SHIPPING & FREE RETURNS! As a busy, working mama, I love this and take total advantage of these perks.